My interest in bespoke business cards began over 40 years ago when I was serving an apprenticeship as a compositor (typesetter) at small market town printing firm that would have made Eric Gill think he'd taken a step back in time. 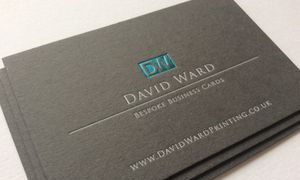 I used to supplement my meagre apprentice wages by printing letterpress business cards at home in my spare time for various local businesses. In those days all type was metal - either hand set from the case or line cast on hot metal typecasting machines. 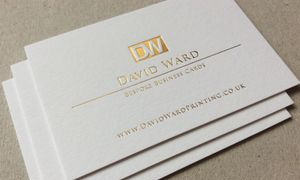 After working at several printing firms in order to gain enough experience to follow my dream of having my own little business I launched 'David Ward Printing' in 1977 and concentrated on general commercial printing and especially NCR Business Forms which I found to be the most lucrative. At this time we were printing mainly using the lithographic process. At the age of 50 I decided to semi retire and spend more time in Spain, especially in the winter months but after a few years of relaxing the entrepreneurial spirit resurfaced and I wanted to get back to running a business. I was thinking of starting a totally different kind of business when the new wave of interest in letterpress printing caught my eye with the beautiful letterpress and embossed greeting cards from Steve Jobs at Apple.inc. as part of their iPhoto offerings. I decided I'd like to make myself some Letterpress Foil Business Cards and bought a vintage hot foiling machine. I was quite surprised how much satisfaction I got from using the old artisan methods again - but even more surprising was the reaction of people to whom I gave a business card - just about always a 'WOW this is a stunning card' I think these reactions were because most people in recent years had only seen the cheap thin cards from the likes of Vistaprint and Prontaprint etc. A professionally designed and produced letterpress foil business card is in a totally different league to the cheap digital and litho stuff and certainly makes a very serious first impression on everyone who receives one.